The whole event left me absolutely astonished at the interaction between my Mum and the bird! I mean I actually heard it call to say it's here and my Mum went running out with pork chops for it. Brilliant!! 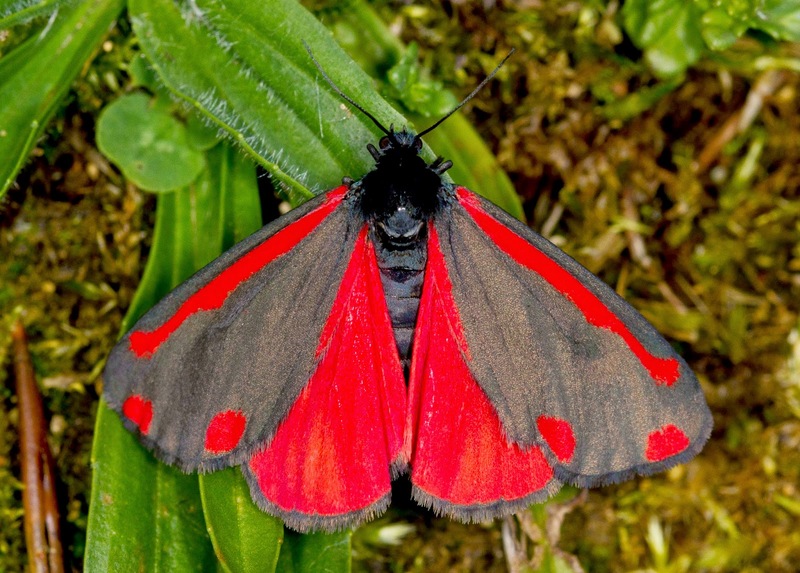 The bank holiday weekend of the 24th - 26th of May was a very good one for me and I managed to get some decent shots of some truly magnificent butterflies. The weekend had a damp start with rain all day on Saturday but luckily it held off long enough in the morning for me to help complete a Dawn Chorus walk for the Wildlife Trusts. We had a decent amount of singing birds for the group who'd remained enthusiastic throughout despite the ever building rain clouds. Unfortunately though as soon as it finished the rain started to lash down and the rest of the day was a write off. 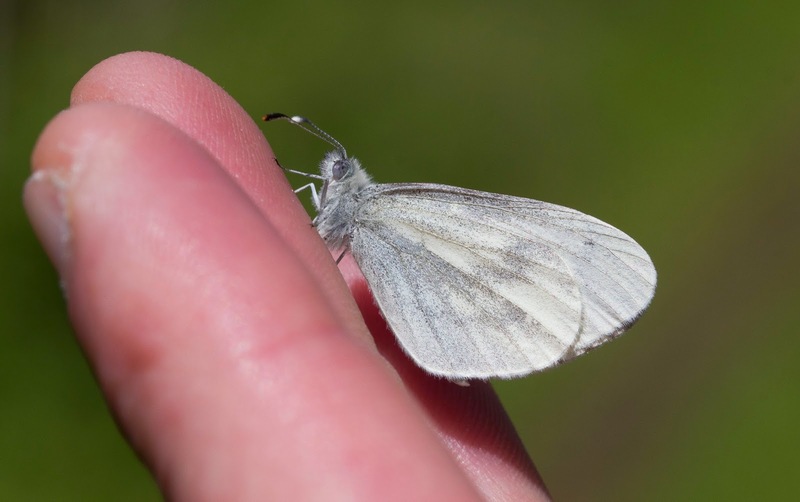 Sunday the 25th was a different matter though and from early morning large expanses of blue sky could be seen which was very encouraging as today had been set aside to find Wood White butterflies. 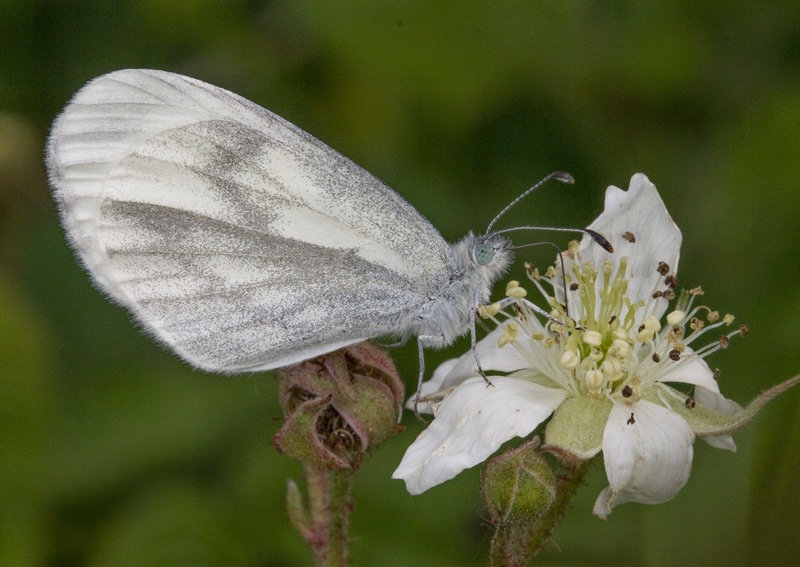 Wood Whites are one of the speciality butterflies for us here in Northants and it was no surprise when a birding mate of mine (in the shape of Sam Viles) was asking for directions to the best places to see them and as I was going to have a look anyway we decided to meet up and go together. Me and Sam Candy met Sam Viles and David (Sam's Dad) in the car park of the local supermarket and they followed us to Sywell Wood just north of Northampton. 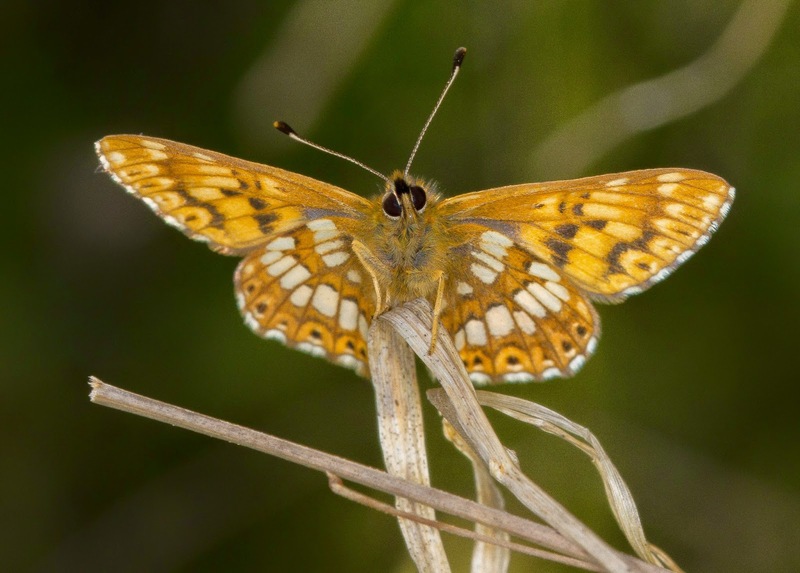 This is easily one of the best sites in the county for these dainty little butterflies and you can be afforded great views almost straight after getting out the car and it wasn't long before we were on one. Then we found another, and another, and another! I've never seen so many all in one place. At one point Sam Viles turned round and had 10 in his field of view all at the same time. 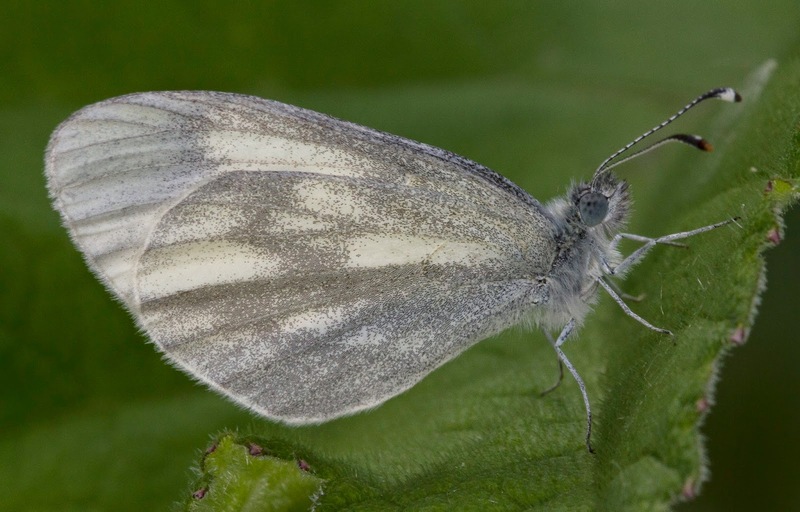 It also looked like the recent inclement weather followed by this sudden spell of warm weather had triggered an emergence as some of the Wood White we were finding had very crinkled up wings and would pose for pictures with ease. 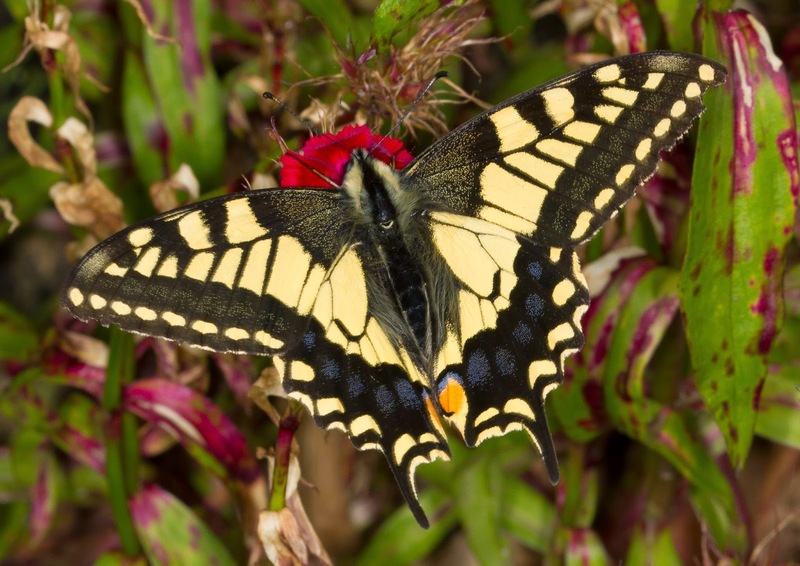 I've know from years of experience that getting pics of these butterflies can very frustrating as they sometimes hardly stop for more than a second but today it was different and we found them on the ground, on grass, on bushes and flowers. One even took a rest on my finger to pose for a pic! 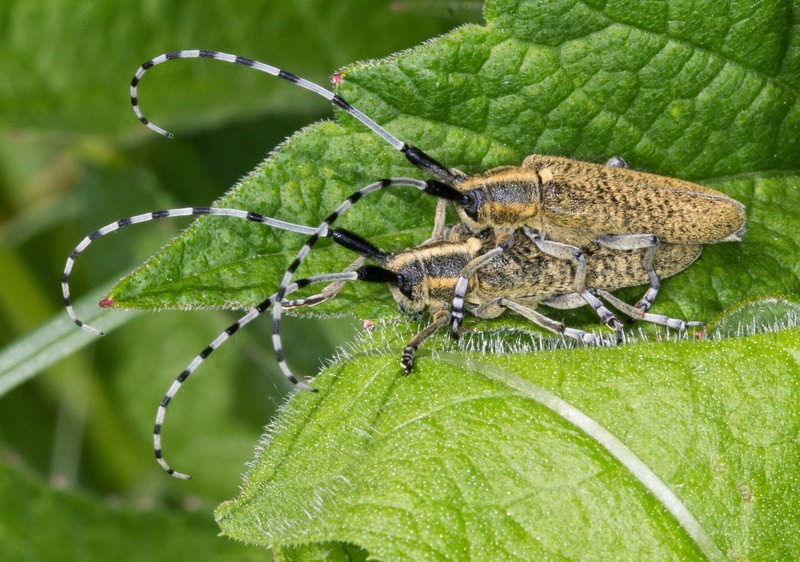 There was also plenty of other impressive looking insects to be seen along the main ride with Cinnabar Moths on the wing and some great looking Golden Bloom Longhorn Beetles with a pair proving to be very photogenic as they secured the next generation. After this we parted our ways and me and Sam Candy headed to a private site in Northants that's an amazing place to see Green Winged Orchids. 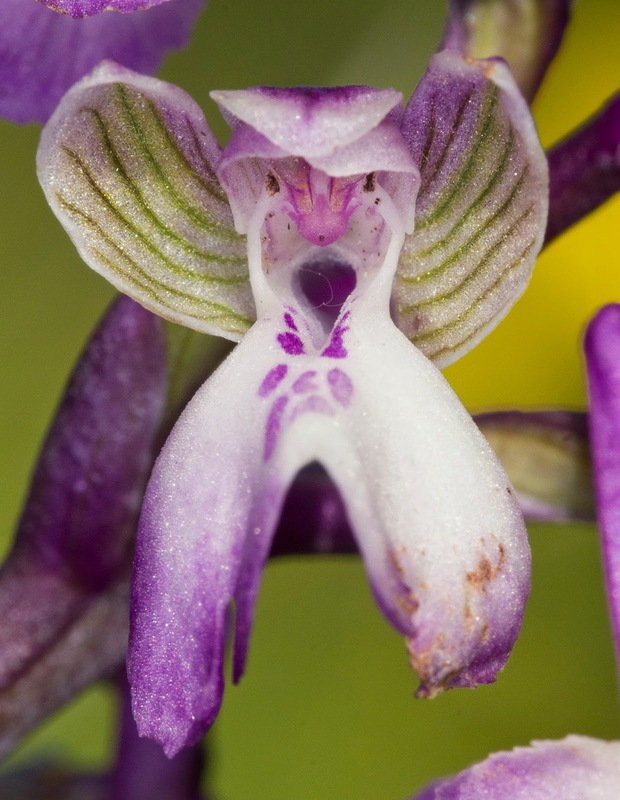 Unfortunately we arrived a little late in the year and all the orchids had "gone over" but we did find a great looking white variant and shooting a macro shot on one of the better looking specimens showed the strange human characteristics of the flower. 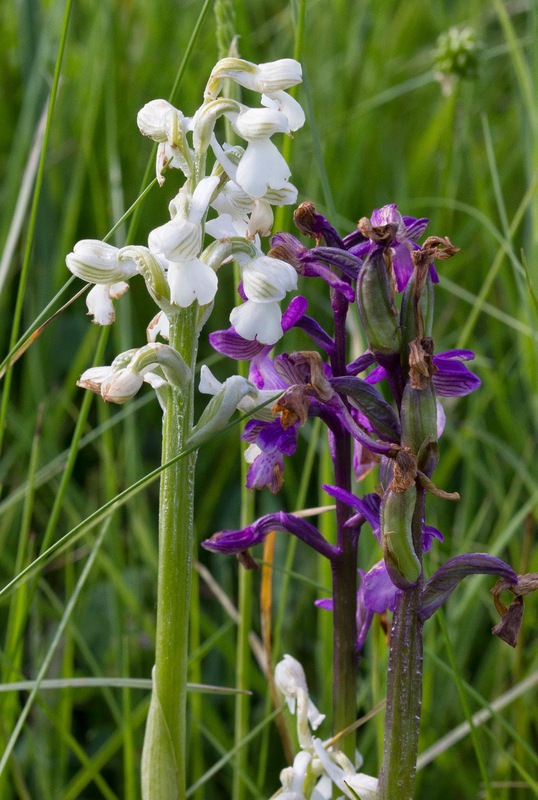 White Variant Green Winged Orchid, Northants. On the bank holiday Monday the weather once again took a turn for the worse and a forecast of rain all day was the greeting I received in the morning. I started to browse different areas on my phone's weather app saw that the weather in Norfolk was forecast to be superb - I then suddenly had one of those lightbulb moments! 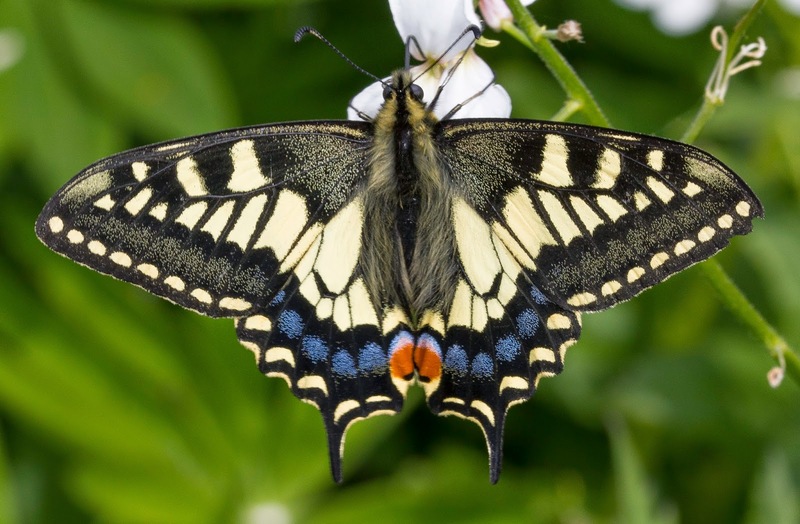 My mind straight away went to Swallowtail butterflies and I rang Jon and Kirsty who readily agreed and within the hour we were driving to Norfolk. 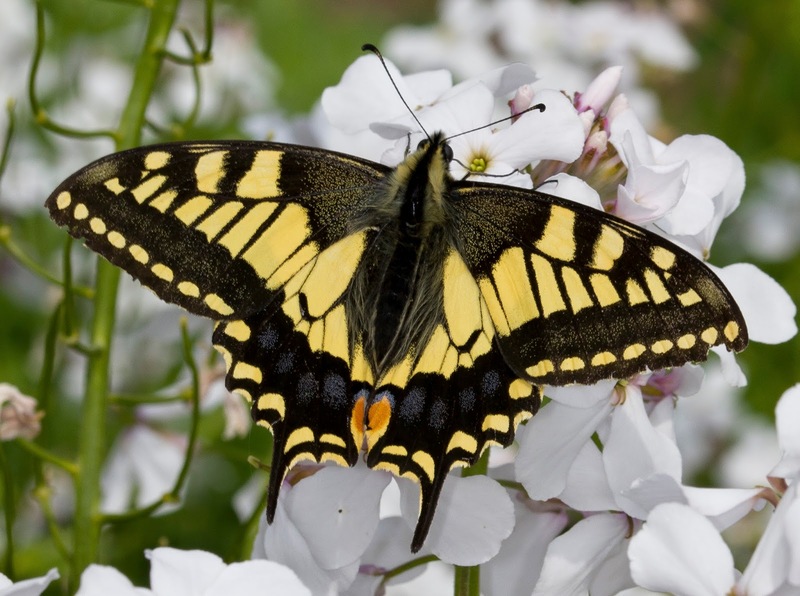 Sam Viles, who'd accompanied us the previous day for the Wood Whites, gave me directions in the morning to the infamous "Doctor's House" near Strumpshaw Fen where the very kind owners allow people to venture onto their front lawn to photograph Swallowtails visiting the flowers. 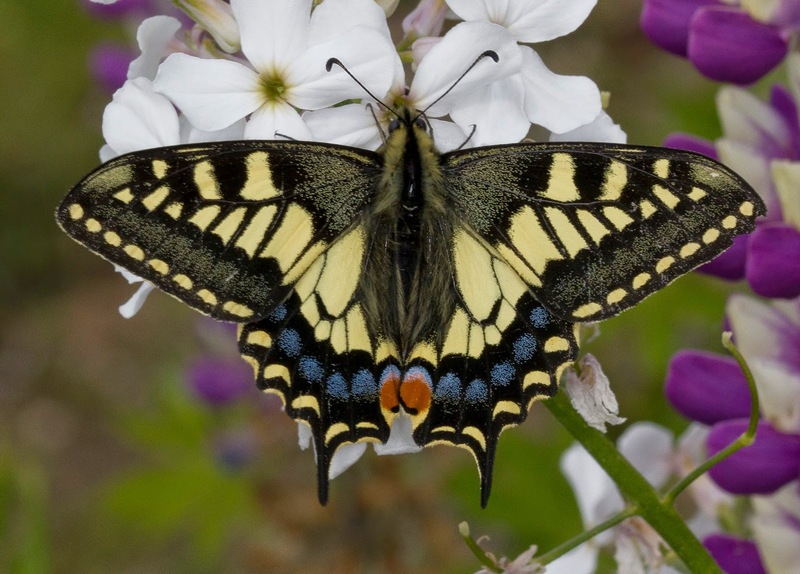 We almost straight away had a Swallowtail flying over the small clearing before the house and when we got to the house proper we had one come in and land on the flowers. Despite us taking pic after pic getting one straight on isn't as easy as it looks but it was looking like it was only a matter of time as after changing camera settings the pics started to get better. The first one flew off and we spent a bit of time taking pics of the amazing looking Swollen-thigh Beetles hiding in amongst the flowers. 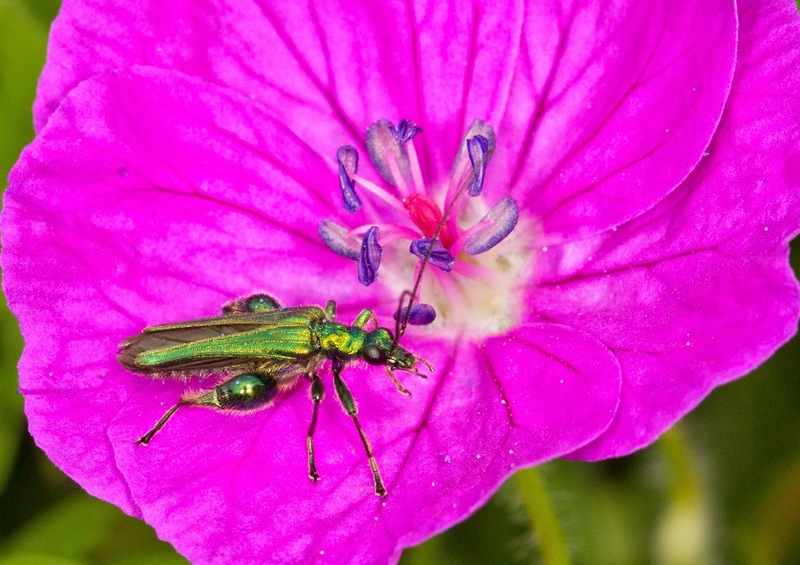 Swollen-thighed Beetle, Strumpshaw Fen, Norfolk. 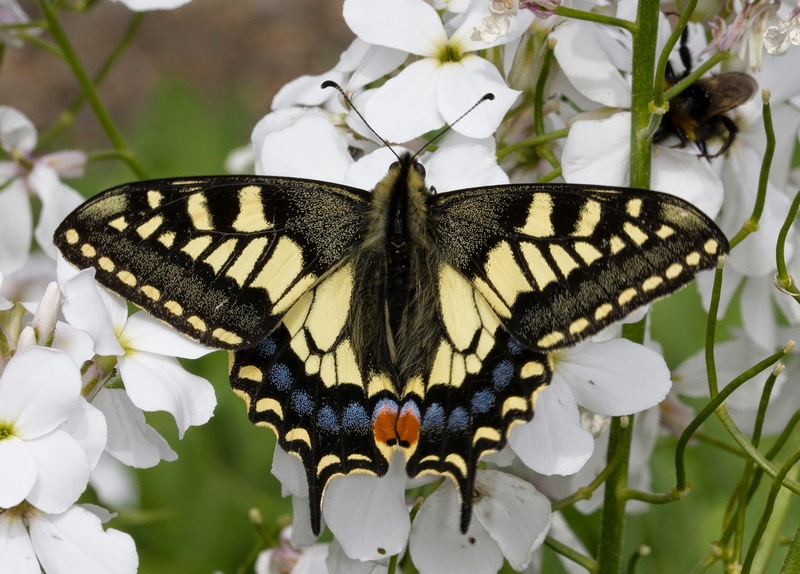 We didn't have to wait too long for the next Swallowtail to fly in and then shortly after another joined it. They were absolutely pristine and watching them feed on the flowers in front of us was an amazing sight. Not only this but they both hung around for over an hour allowing us to get lots of pics and plenty of passers by were able to enjoy them too. Apologies for posting so many pics of them but I am still staggered by their beauty - just stunning! 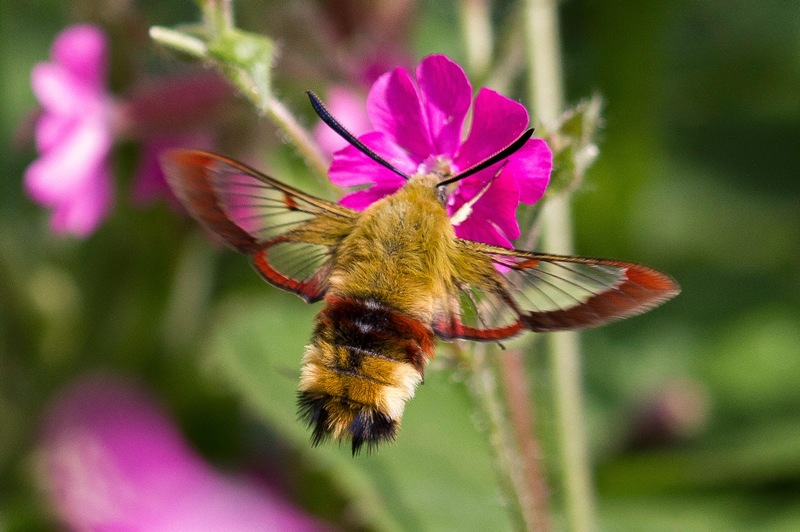 After spending a large part of the day here Kirsty came up with the great idea of heading to Holt Country Park to see the Broad Bordered Bee Hawkmoths that had been wowing the crowds there. As soon as we pulled in we saw a couple with cameras and after a brief chat we discovered they were showing right in the car park. 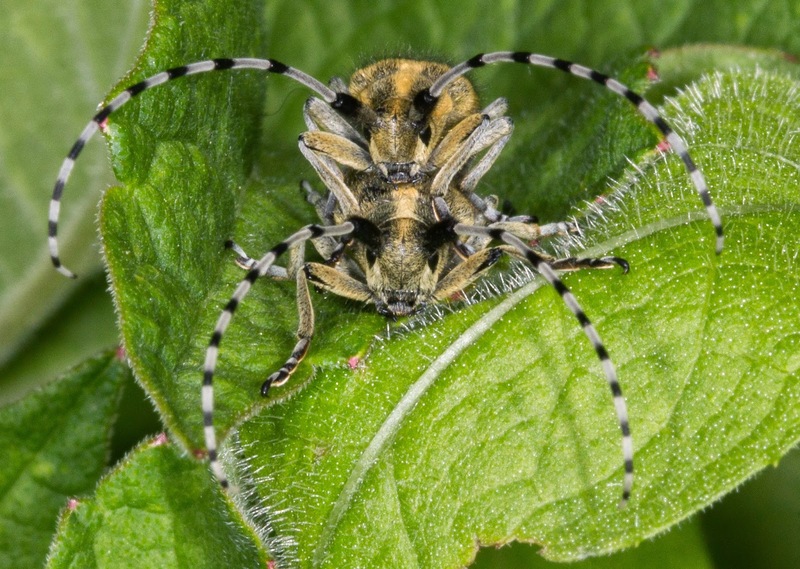 We were soon onto these amazing insects and tried to keep up with them as they hovered and darted from flower to flower snapping away as they did so. It was quite a challenge to get a good pic but as always perseverance pays off and I got some pics I was really happy with. 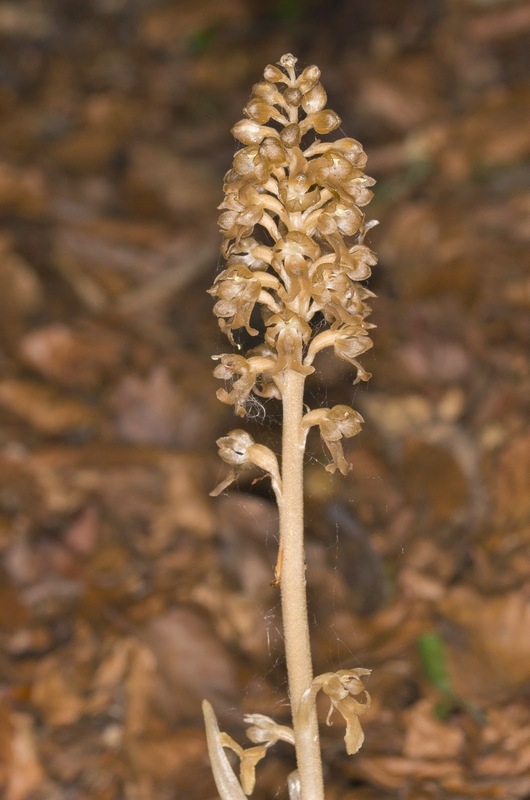 We had also been told of Birds Nest Orchid but despite searching I couldn't find any at all but luckily for us a good friend of mine, Kieran Nixon, lives in the nearby village and after having a quick drink at his house returned with us to the site and put us onto them straight away! Never ever under value the benefit of local knowledge. Apologies for poor quality of pic but it was late in the day and the light was fading so I had no option but to use a great deal of flash, at least it's a record of a flower I have never seen before. From here we had to reluctantly call it a day and we drove home still buzzing from the days sightings. 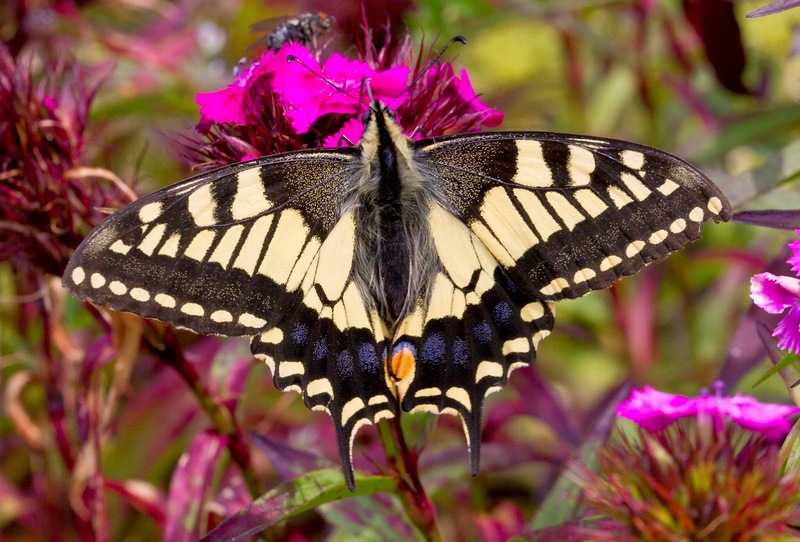 It had been one of those days that will forever remind us why we do all this in the first place and getting the pics I managed to achieve of the Swallowtails actually fulfilled a dream I have had for many years. 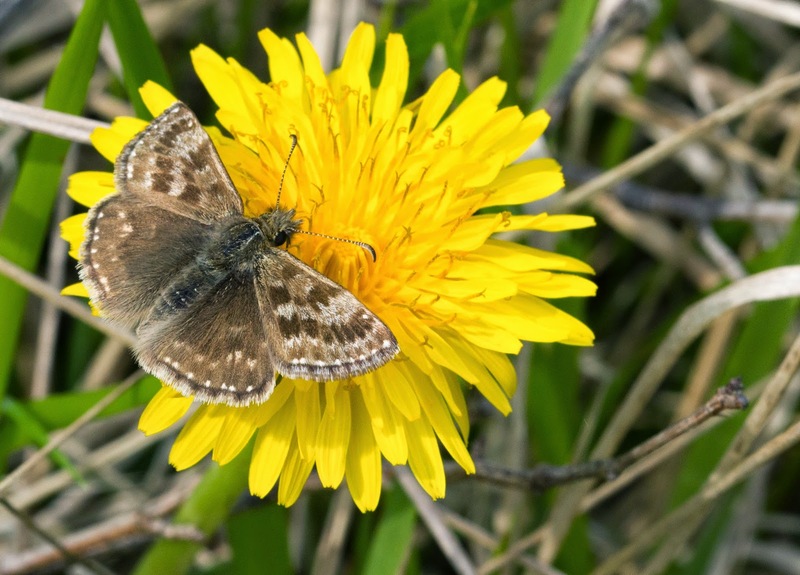 I'm back up to Scotland next week for Chequered Skippers so lets hope for some good weather! A lot has happened since the last post and I have to admit in all the excitement I've been neglecting the blog a tad so this post maybe a big one as I've decided to do sections in one post as oppose to lots of single ones. 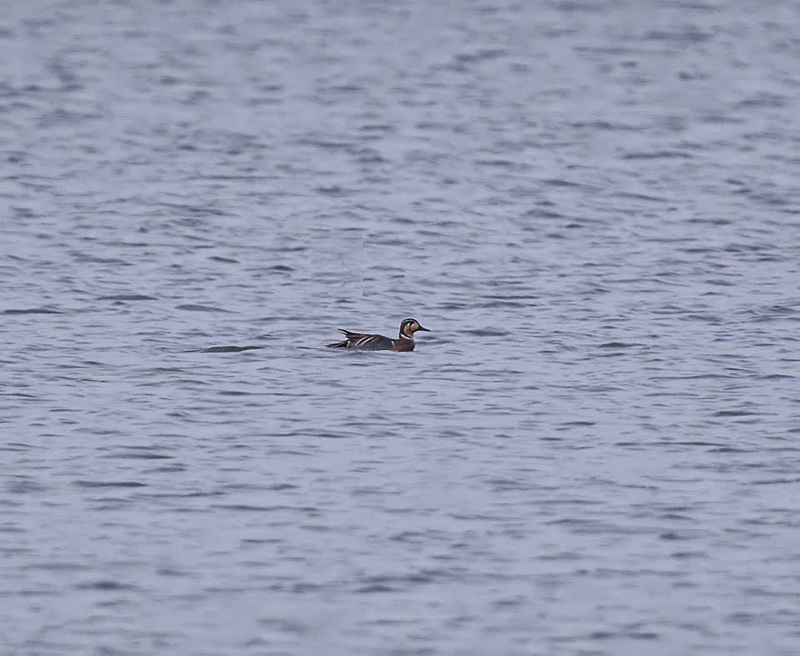 Bird wise it has been a good spring for us as a report came in of a drake Baikal Teal at nearby Fen Drayton RSPB reserve on the 31st of March. Me, Jon and Kirsty raced over there through the rush hour traffic and despite crashes (not us luckily) and the resulting traffic jams around Huntingdon we somehow managed to get there and see it. It is of course of dubious origin so it will have to stay off my British List until the BBRC makes it's decision but either way it was a corking looking bird! 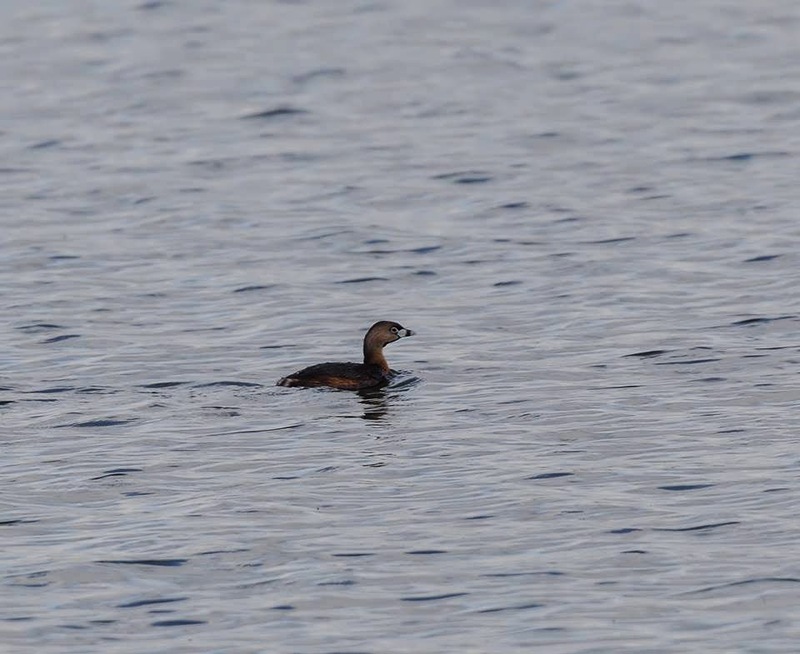 The following week on the 7th of April another successful after work twitch was repeated when a cracking little Pied Billed Grebe turned up at Rutland Water. Here's a short video of the bird (as always turn up the settings to the highest resolution) and one of Jon Philpots pics. My absolute favourite birds of the spring though came in the shape of two Red Rumped Swallows and a small trip of Dotterel, mainly as they used to be my bogey birds! Red Rumped Swallows have eluded me for years, even the Grafham Water bird from a couple of years ago that was enjoyed by so many people wasn't to be seen whenever I went! Only for it to be reported again an hour or two after I left. So when, on the 20th of April, a report comes through of a Red Rumped Swallow on the Ouse Washes I straight away decided against going. Lets face it twitching something as fast moving as a Swallow is never going to be easy but when another report came through of there being two Red Rumped Swallows in the same place it changed things and I headed straight over. I have to admit to being somewhat of a pessimist when twitching birds - especially birds that for some reason I have always had difficulty in seeing. I spent the whole journey questioning why I was doing this as sod law dictates it was obvious they'd clear off just as I got there but I kept driving all the same. My negativity seemed to be justified however as when my sat nav said I was within 20 miles of the reserve a report came through on the phone that they'd gone! As I was so close to the area I decided to persevere though and head to the site and joined the other not very happy people in the same predicament as me. They hadn't been seen for an hour and a half and the huge ball of Swallows and Martins flying over the area infront of me showed that it was going to be a needle in a haystack job at the very least. More people arrived and gradually a group split up from the rest of us to have a look along the river promising a phone call if they found anything while the rest of us went through every Swallow that passed over with the hope of seeing the elusive Red Rumped. After about an hour a phone rang and it turned out to be a member of the other party to say that they'd found both of them along the river. I'm not going to lie here, I ran! In fact I ran as fast as I could along the bank and through gates and a small herd of cows until I reached the others. They'd seen both the Red Rumped Swallows distantly and eventually I managed to pick them out. Luckily they split up and one of the Red Rumps following a group of Swallows which headed closer to us and then started feeding behind a large tree. We watched as it gave us fleeting glimpses while it darted back and forth behind the large canopy and then eventually a bird could be seen to come out from behind the tree and fly slowly against the prevailing wind along the path we were standing on. One of the Red Rumped Swallows was heading straight towards us! In a final nice touch as it flew slowly overhead it gave a little tilt showing us it's Red Rump! At last, Red Rumped Swallow finally unblocked and added to the list. I gave a huge sigh of relief and walked slowly back towards the car with a big smile on my face! A few days later on the 25th April a small trip of 3 Dotterel were reported near Peterborough and as I had the day off I headed over. Luckily I somehow managed to find the area they were in and after a walk along various greenlanes I got a view of my first Dotterel. Strange to admit that after 10 years of serious birding Dotterel were lifers for me, I guess it was one of those birds that I knew I'd bump into eventually so didn't try very hard, hence why ten years later I've only just seen them! The last Dotterel I went to see had been present for over a week in Oxfordshire but decided to fly away an hour before I got there and never returned. Rubbish distant video below but it's a record I guess. 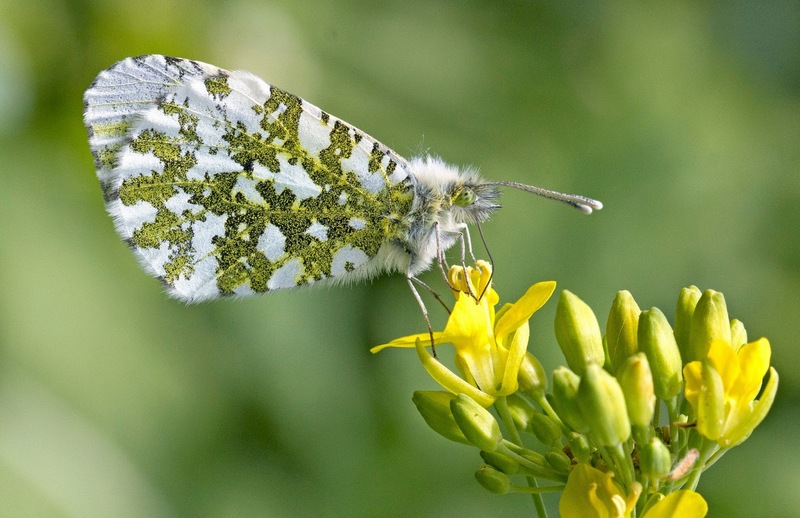 I had set myself the challenge this year of getting decent pics of Orange Tips as in previous years I was always still too bird orientated during the spring and never really gave them much attention. 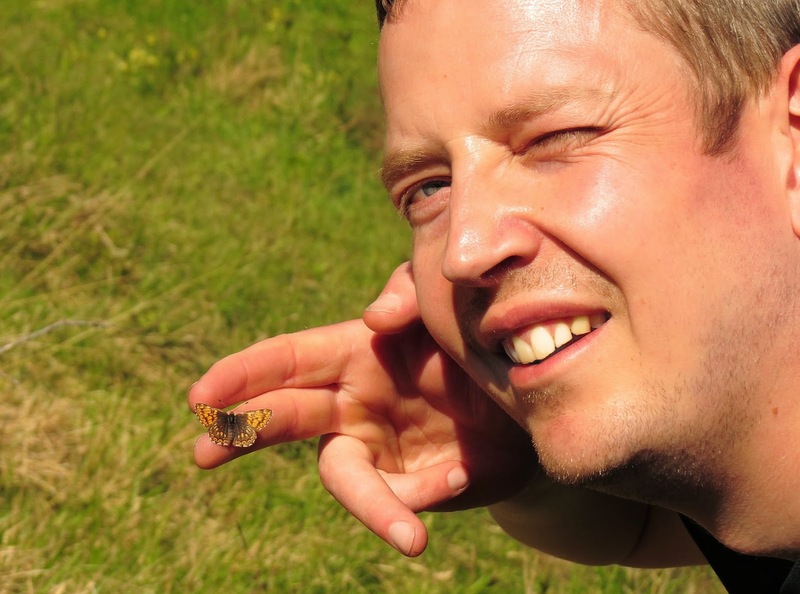 As soon as they came out me Jon and Kirsty were out trying to get pics of these incredibly frustrating butterflies. They simply do not stay still long enough to get the a pic and as I really wanted a pic of the underwing it became clear that the best tactic was to watch them fly and then as soon as the sun goes behind a cloud see where they land. They'll sit there very happily when the suns in and you can get some great close up shots but as soon as that suns back out they're off. I did get some upper wing shots but to be honest I really don't think the upper wing compares to the amazing pattern on the underside. The best places for photography we found was Wootton Brook, Salcey Forest and the Billing area. 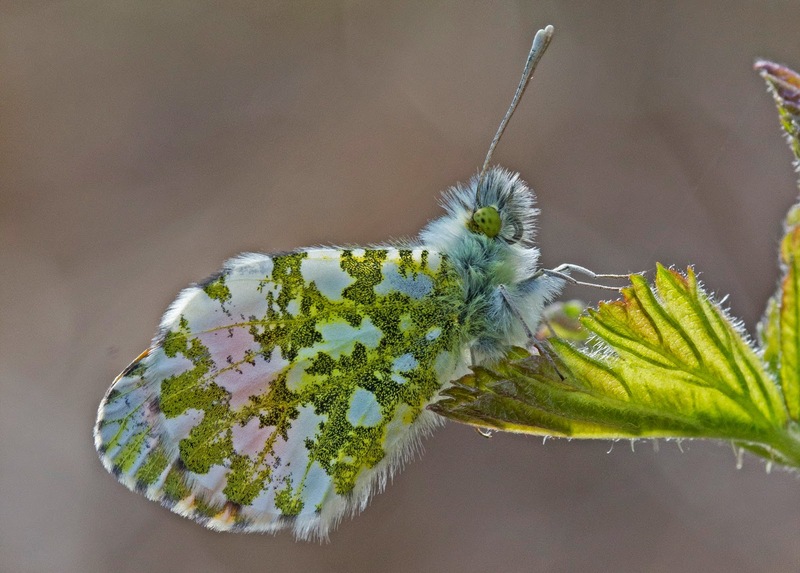 Male Orange Tip, Wootton Brook, Northampton. 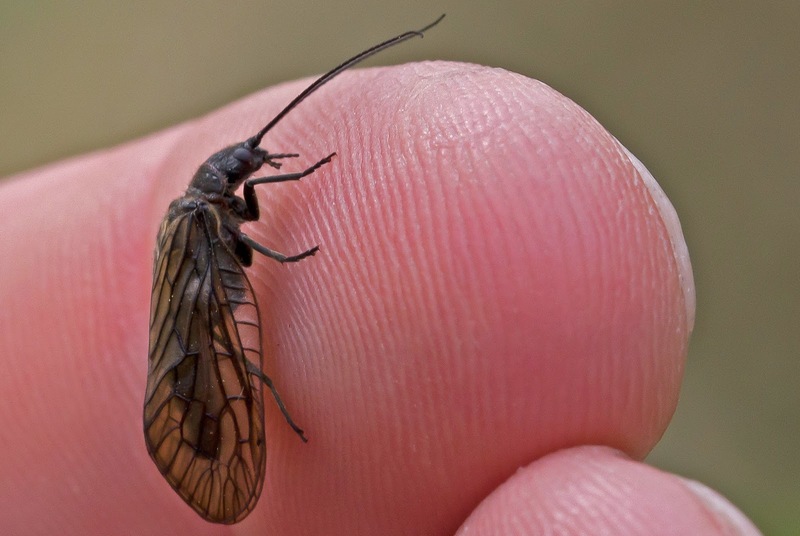 We also had an Alder fly pause on my finger for a while before heading off on it's journey at Wootton Brook. 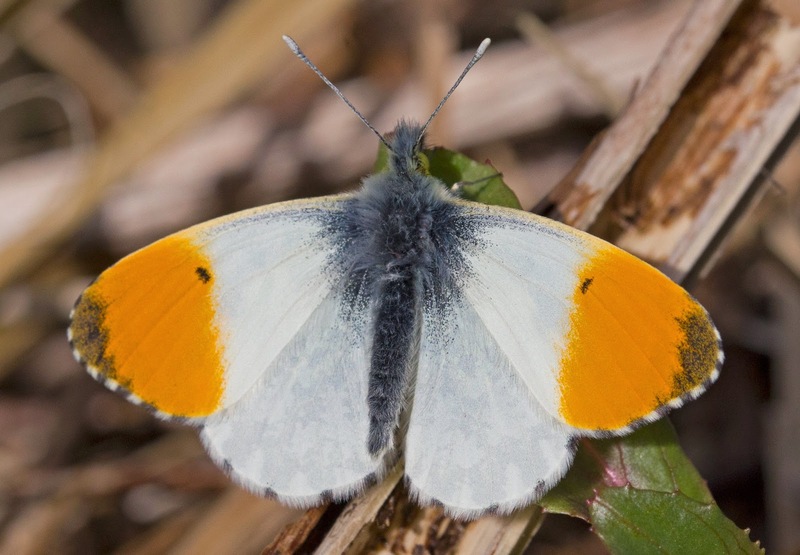 After the Orange Tips we had to wait for the other butterflies to start emerging. 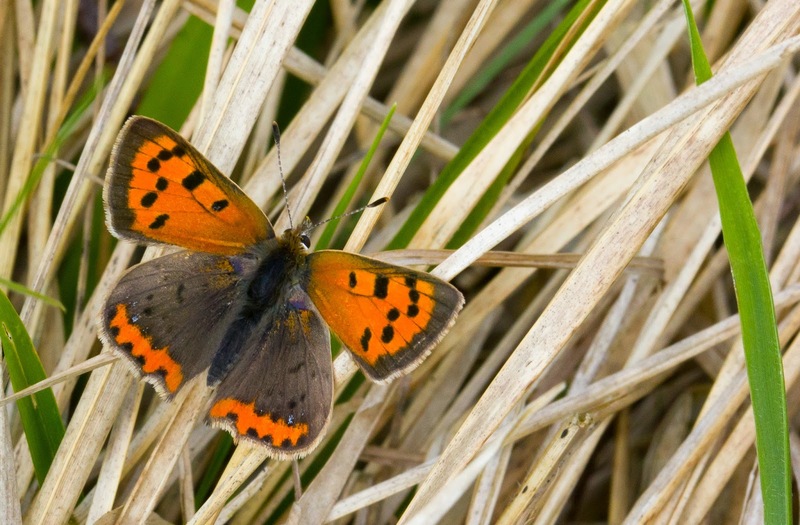 Gradually things started to appear and regular trips to Twywell Hills and Dales got the specialities there with Small Coppers, Dingy and Grizzled Skippers showing well. We didn't have to wait long though for the first Duke of Burgundies to arrive. They were a lifer for me so a whole weekend was dedicated to seeing them and as they only live for a week it was a relief when we had some nice weather to coincide with my time off work. 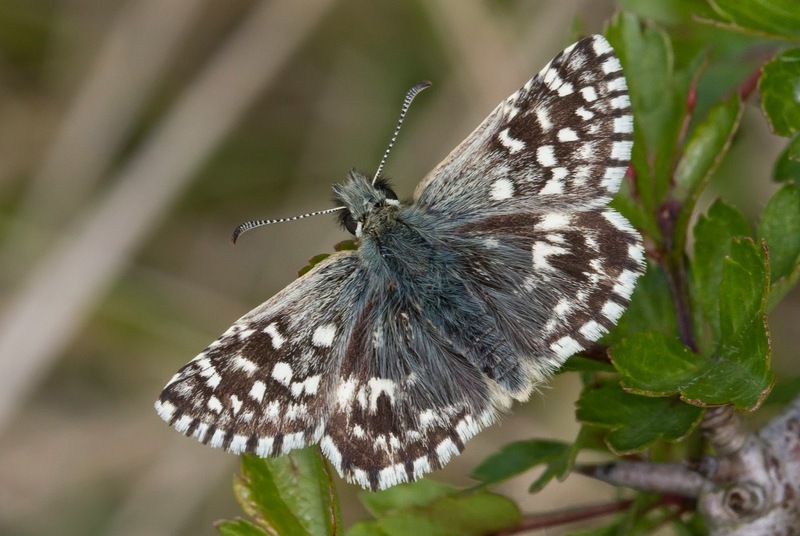 On the Saturday the 3rd of May me and John Friendship-Taylor headed over to Gloucestershire and met up with a butterfly mate of mine Paul Brewster and his wife Carys at Prestbury Common. We scoured the whole site but the main highlight on the slopes were the pair of Tree Pipits singing from a bush. 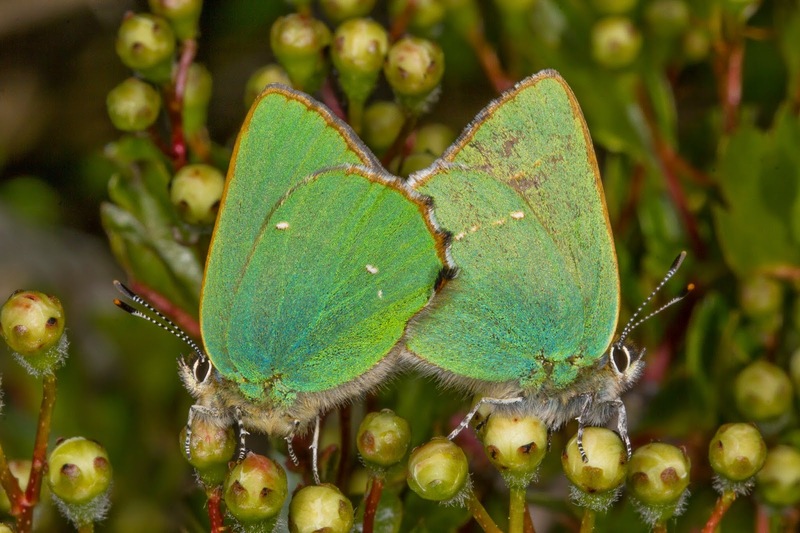 As we headed down to the lower sections we found lots of Green Hairstreaks in the bushes and they showed really well and allowed some very close photography. We were even lucky enough to see a pair flirting before going into cop. The real highlight of the site though came later in the morning as we decided to head somewhere else. We walked up the steep slope and did a final check in one of the small hollows. 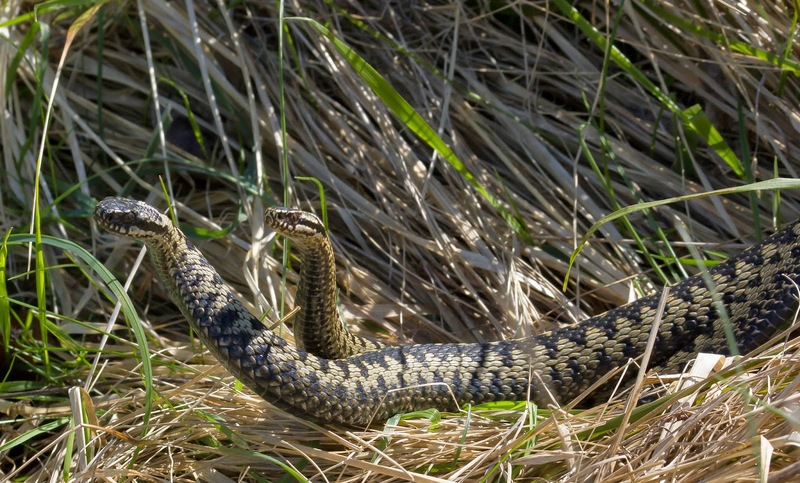 Almost straight away Carys noticed a snake and we couldn't believe our eyes as an Adder came out of the undergrowth along with another and they started to "dance"! 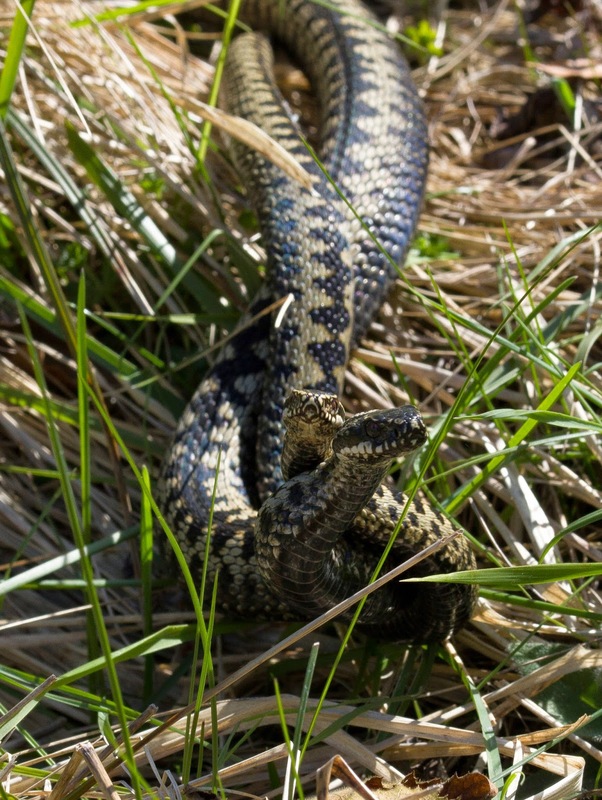 The dance of course isn't really a dance, it's actually two male Adders fighting and they really put on a show as they danced at our feet with a blatant disregard for our presence. I snapped away taking pic after pic and even took a vid or two before they finally broke up and went their seperate ways. I still can't believe we actually witnessed it for ourselves and we joked afterwards that even if that was the only thing we get to see today it would still be worth the trip! Here's a series of pics followed by a short clip. 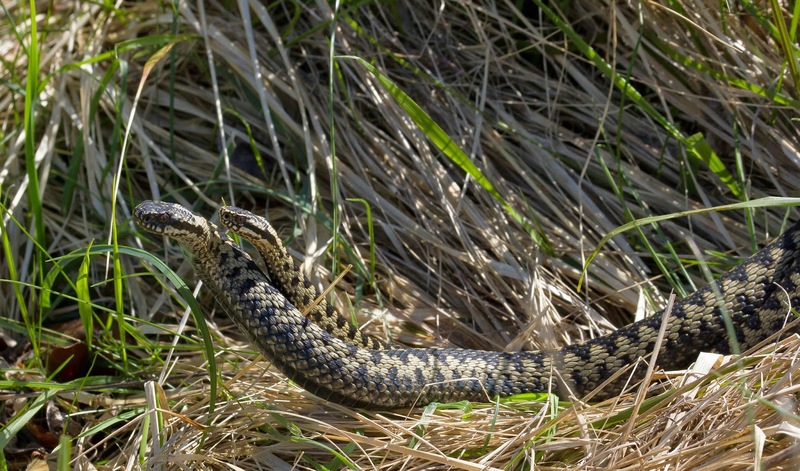 Adders Dancing, Prestbury Hill, Glos. As we left the reserve we met a very nice chap who pointed in the direction of Edge Common for the Duke of Burgundies there. Apparently as the site we were at was so high the altitiude means they come out later which is why we hadn't seen any! 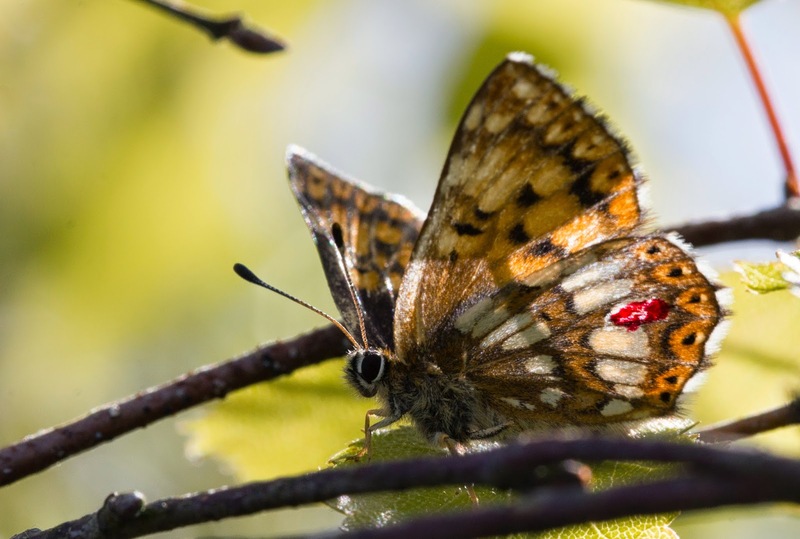 So we all jumped in our cars and heading to this other reserve being rewarded with the sight of Duke of Burgundy butterflies almost immediately. 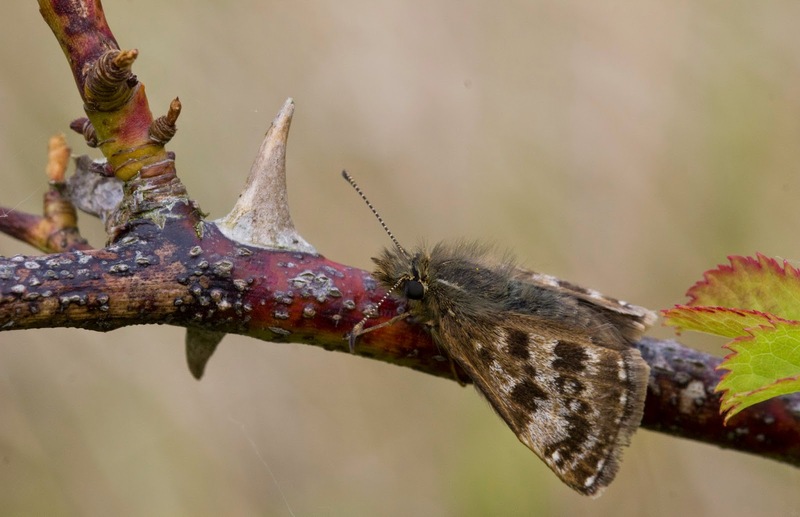 Natural England were also there doing survey work by catching the butterflies and places a small mark of paint on them making getting a photograph of one without a challenge but they're doing such good work to help these endangered butterflies one can't mind this. As it happens we got some good shots of Dukes without the paint and actually some good ones of them with it too, one even posed on my finger for a pic. 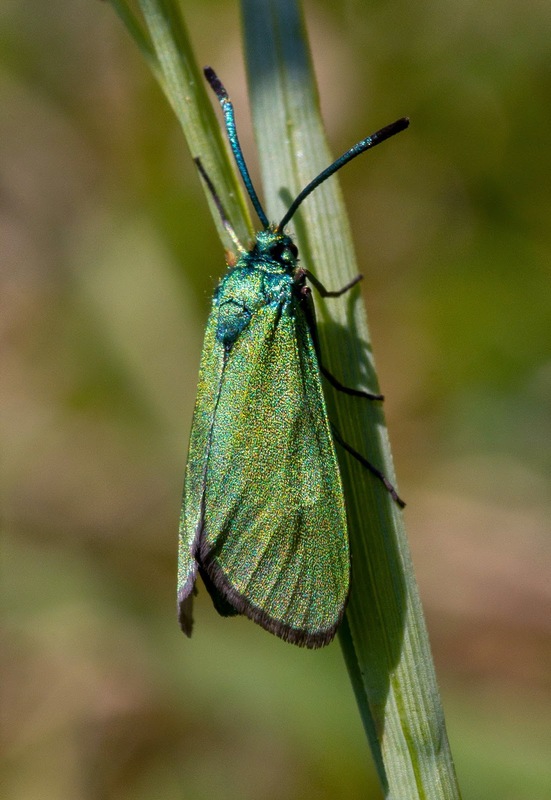 As an added bonus we also had a great view of a Green Hairstreak egg laying in the undergrowth and after seeing the pics we realised she was an aberration punctata. The following day I went down to Totternhoe Old Quarry in Bedfordshire with Jon and Kirsty. Considering the previous days attempts at seeing them I was amazed at just how many there were in such a small area. In one large hollow at the reserve we easily had double figure numbers of Dukes and even had a rogue one on some blossom on the way back to the car. I also managed to get the shot I had been after all weekend as I had tried hard to get a decent underwing pic. 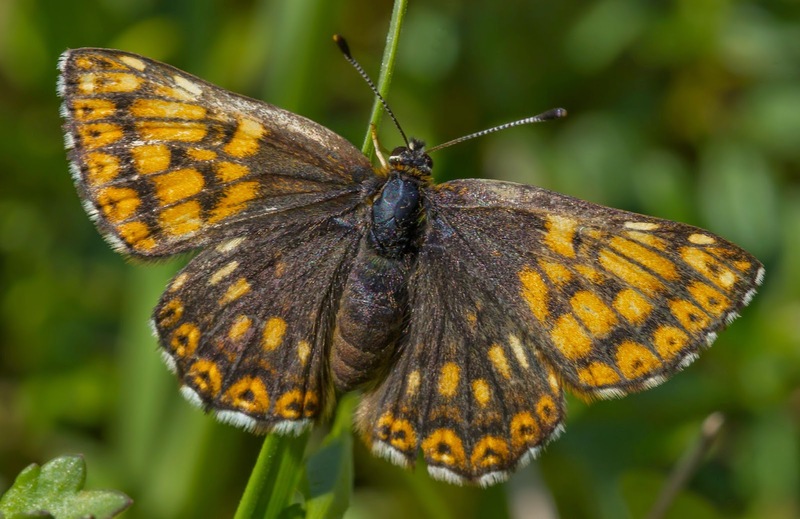 Duke of Burgundy, Totternhoe Quarry, Beds. After enjoying the glut of Dukes we headed out of the reserve seeing a few Holly Blues on the way. 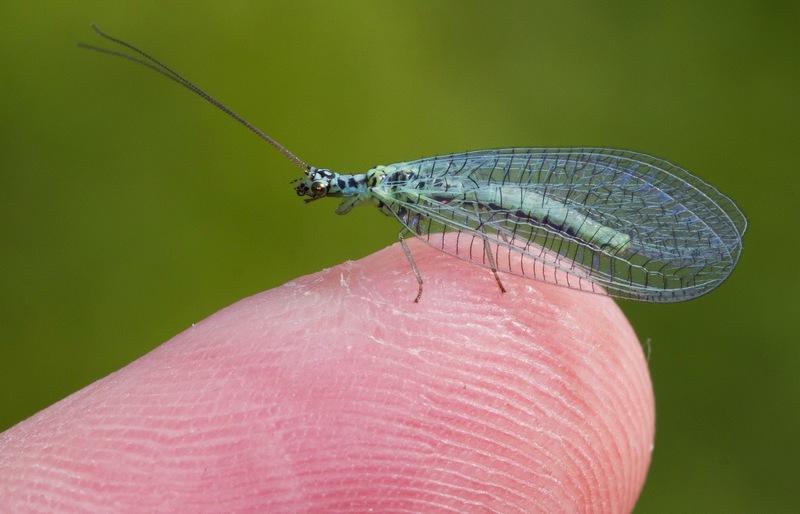 I also had the pleasure of a Lacewing stop momentarily on my finger for a preen and I managed a shot showing just how good looking they are.We also saw a rather dapper looking Crab Spider enjoying a Nettle Weevil lunch. 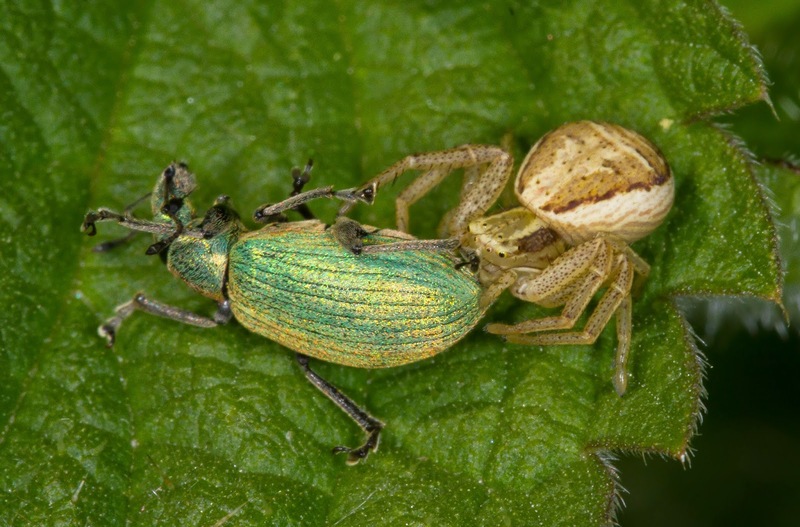 Crab Spider and Nettle Weevil, Totternhoe Old Quarry, Beds. 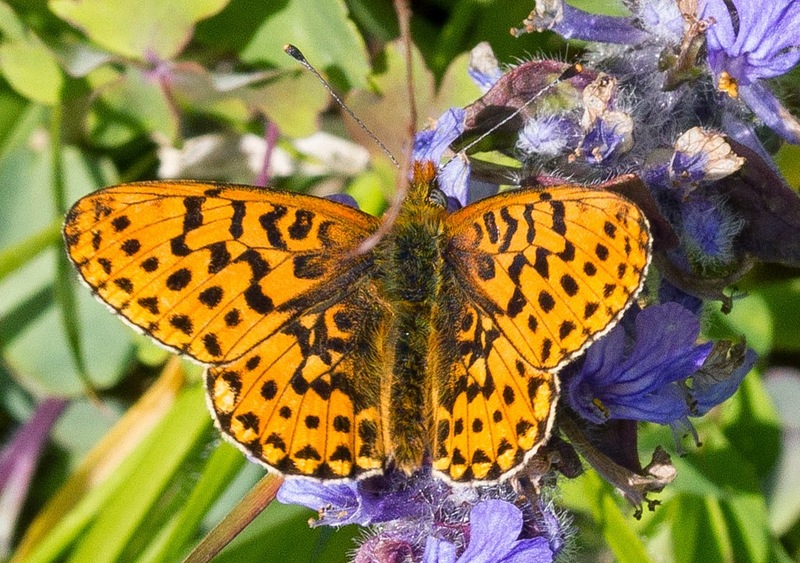 On the Saturday of the 17th of May me Jon and Kirsty decided to head into Gloucestershire in persuit of the local specialities with Marsh and Pearl Bordered Fritlillary being the main targets. 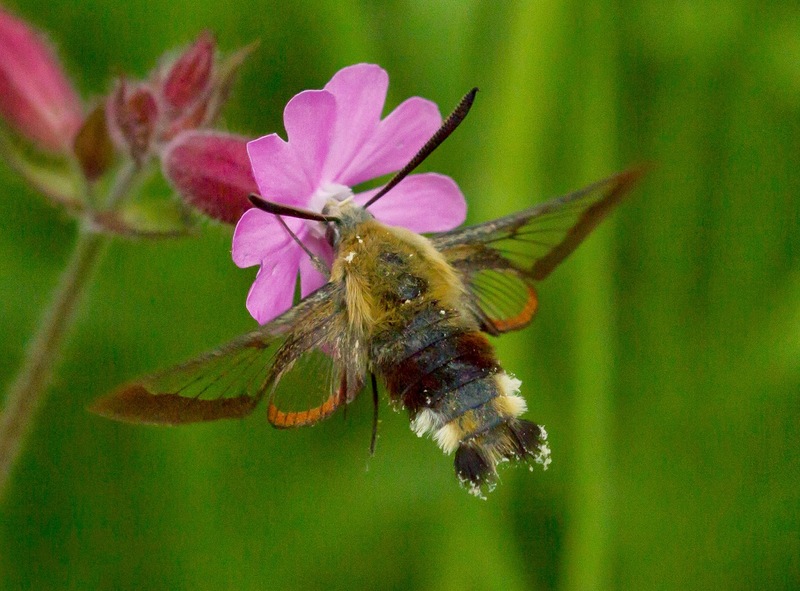 I had heard that Pearl Bordered had been seen during the week at Cirencester Park so this was the first port of call. As always when going somewhere new there's an air of uncertainty as you try and find your way around but eventually we found ourselves in the small clearing just south of the sawmill in Hailey Wood (part of Cirencester Park) and infront of us we were greeted by the spectacle of several Pearl Bordered Fritillary flying around in the woodland glade but trying to get pics of them was a nightmare! They simply wouldn't stay in one place for more than a minute before they shot off out of sight. Despite this I did manage to get a couple of record shots. 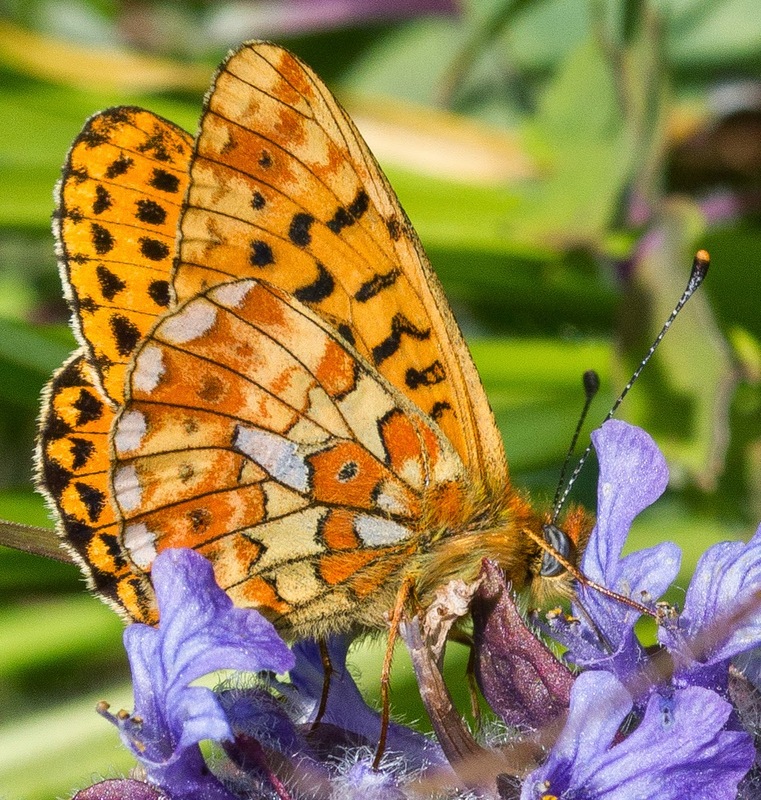 Pearl Bordered Fritillary, Cirencester Park, Glos. 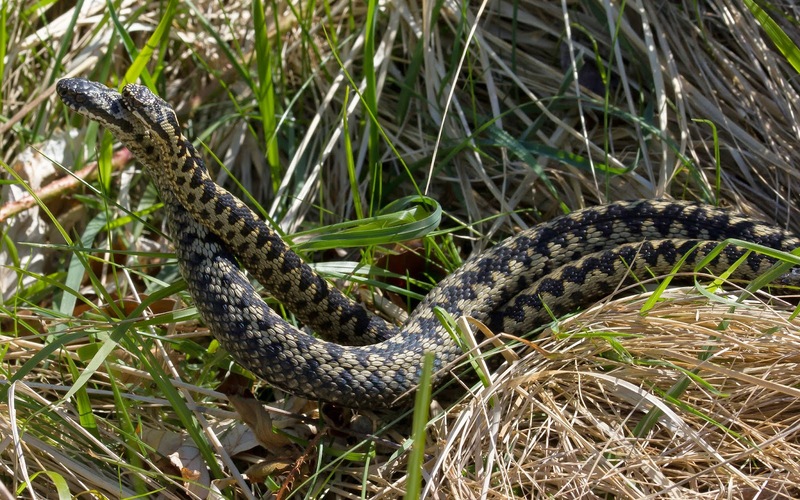 After this we headed to a site called Strawberry Banks for Marsh Fritillary. 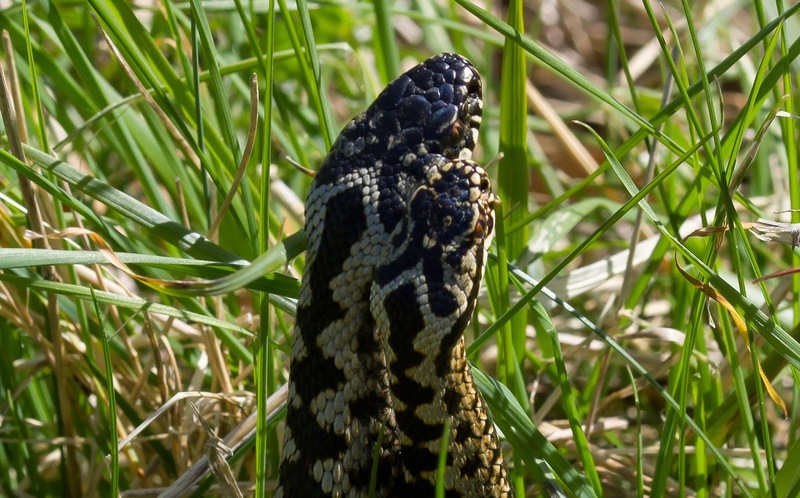 We did this on a bit of an educated guess that they'd be out as they hadn't been reported in the week despite people searching but the recent spell of good weather and the fact that we were only just down the road prompted us to take a look. We were very glad we did as the sight that greeted us when we got there was one which will never be forgotton! We arrived to find a few others already there and the first person I spoke to was grinning from ear to ear. 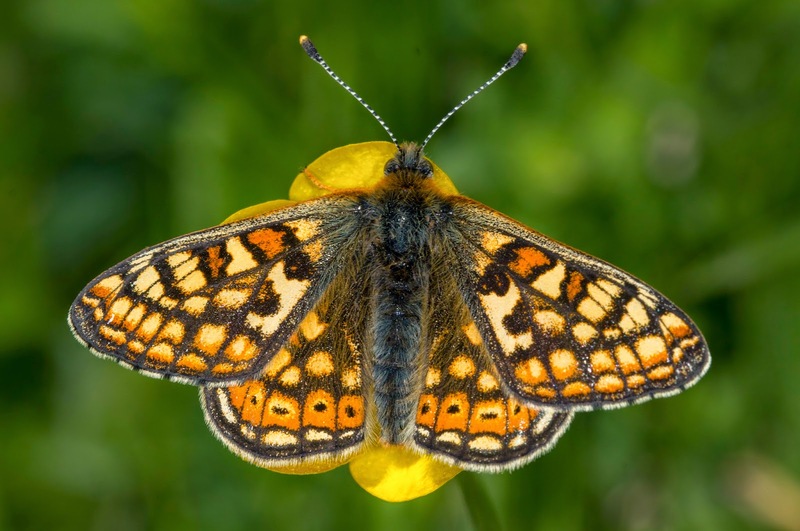 "Have you seen any" I said and he pointed right infront of him to show a pristine Marsh Fritillary sunny itself on a flower head, "there's millions" he replied and I looked round to see lots of Marsh Fritillaries flying around on the slope infront of us. I don't know how we did it but luck was very much on our side as we had not only arrived when they were out but we were actually witnessing the emergence! 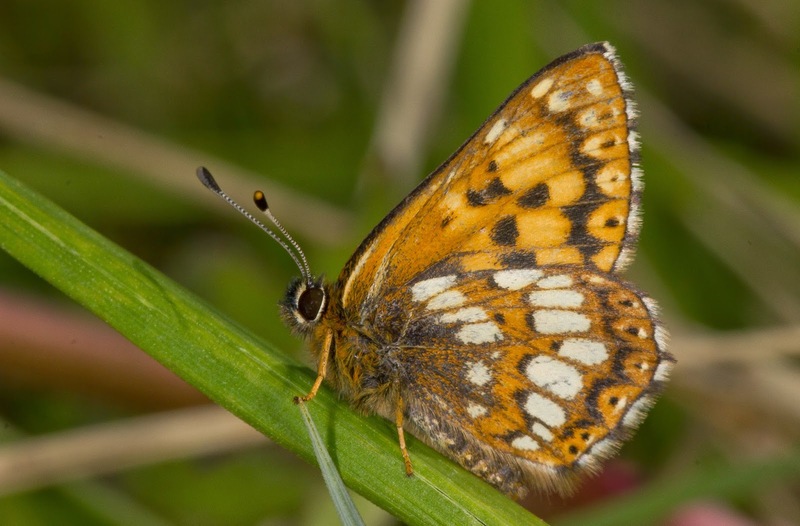 We watched as Marsh Fritillaries crawled from out of the grass with wrinkled wings and started to dry themselves out in the sun, in fact they were everywhere! We watched them feed, bask, emerge and even court each other during the time we were there. Here's a couple of pics showing a Marsh Fritillary basking on a flower and another freshly emerged one drying out. 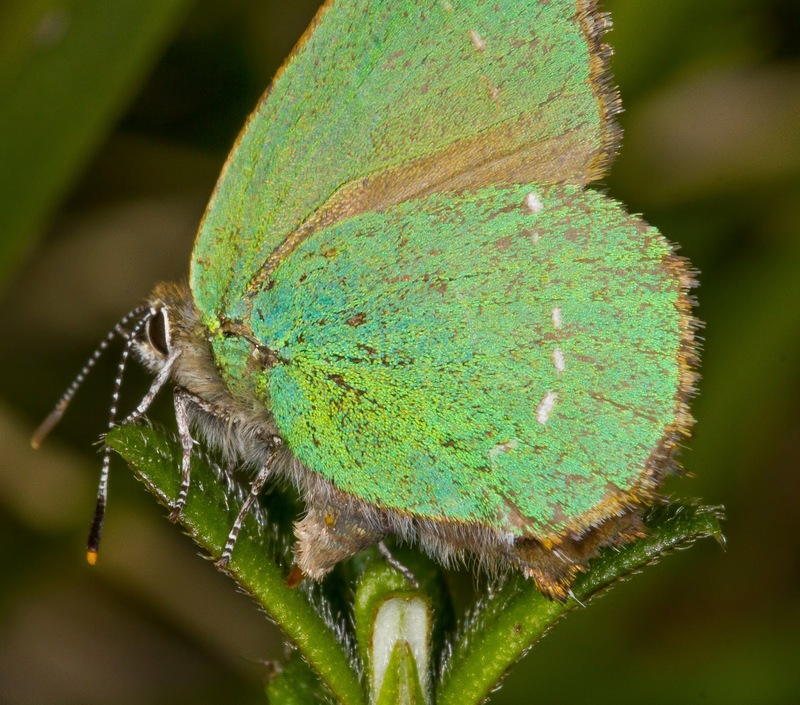 A few Small Blues and Green Hairstreaks provided an added bonus during our visit but after a couple of hours we tore ourselves away. 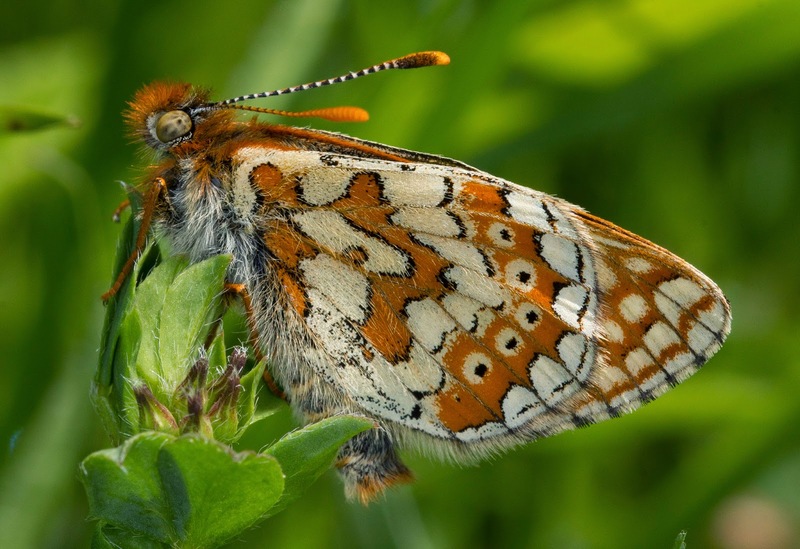 We found it hard to do so as Marsh Fritillaries were lifers for all of us but the amount we saw was incredible and we had more stuff to try for elsewhere. We did find it difficult to leave them behind though after they showed so well! 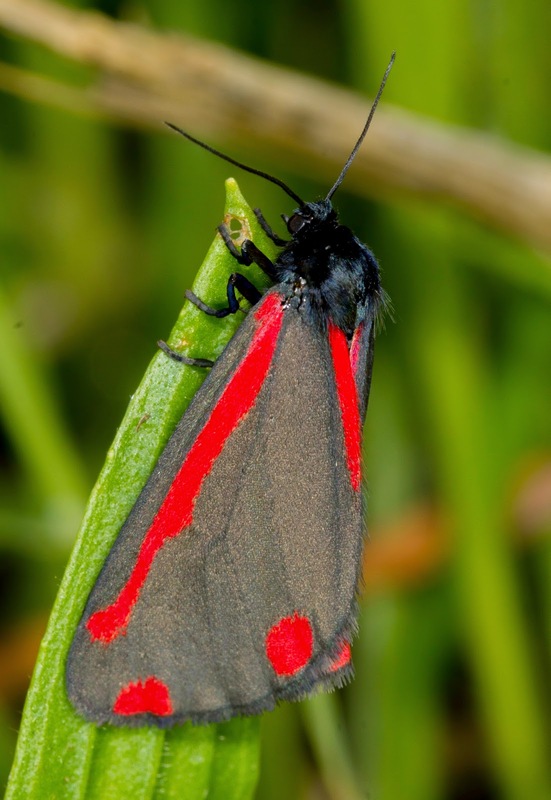 We headed to Rodborough Common after this with the hope of seeing Adonis Blue. We found the area no problem despite the maze of single track roads to get here and with the help of the information boards and their website we found ourselves in the right area to see the Blues. A large and very steep basin was infront of us and we gradually climbed down to the bottom seeing numerous Forrester Moths along the way. As we neared the bottom we could see the beautiful turquoise flash of an Adonis Blue flying around and as we descended we finally caught up with it. It turned around on it's stem before opening it's wings to take full advantage of the sun and despite the less than attractive composition we grabbed a load of pics. 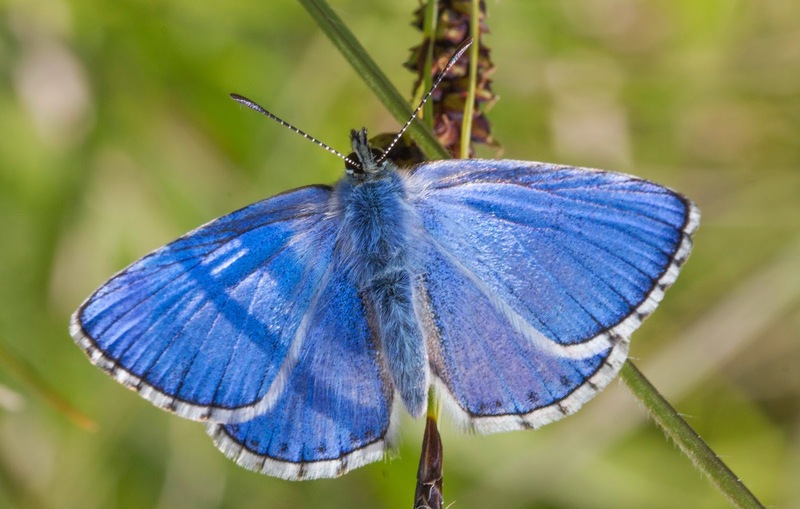 We saw quite a few Adonis flying around while we were there but unfortunately all the others were keeping their wings firmly shut. We did have added bonuses though in the shape of a Brown Argus and loads of Small Blues which after a bit of chasing I finally got a decent pic of. 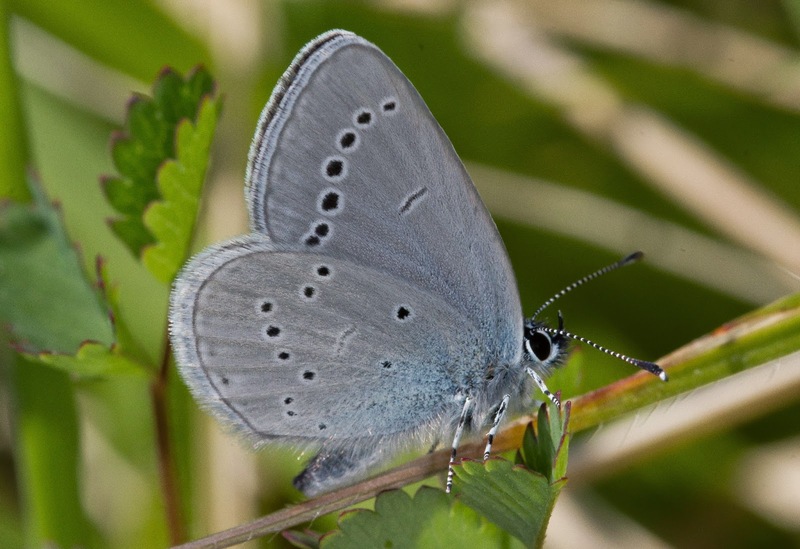 Small Blue, Rodborough Common, Glos. 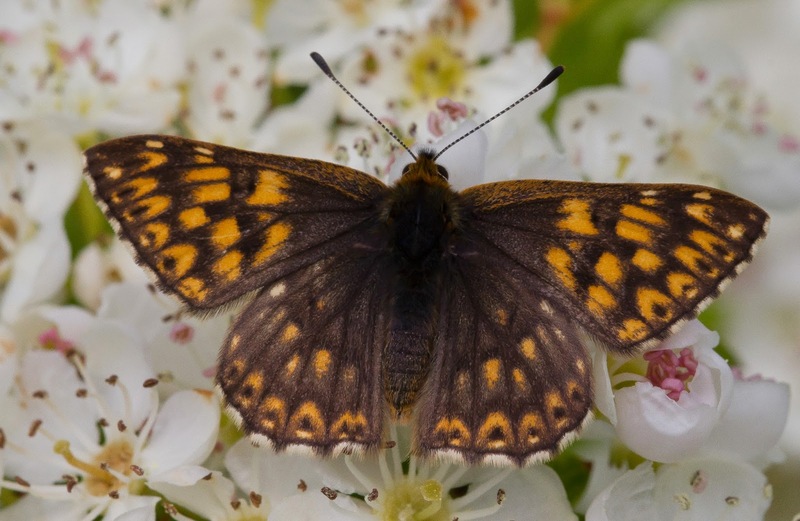 That's the end of the post for now, in the next few weeks I am back off to Scotland with the hope of seeing the Chequered Skipper. Lets hope the weather stays as nice as it is now and I get some pics!